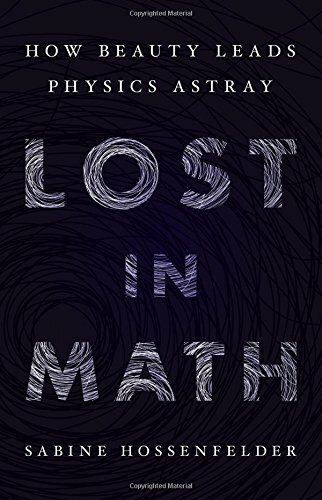 Lost in Math is a very powerful analysis of what has gone wrong in the way that some aspects of physics are undertaken. Until the twentieth century, scientists made observations and experiments and theoreticians looked for theories which explained them, which could then be tested against further experiments and observations. 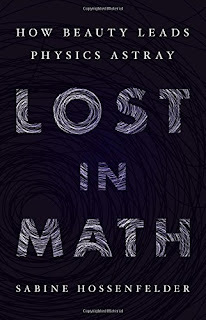 Now, particularly in particle physics, it's more the case that physicists dream up whole rafts of theory supported only by mathematics, much of which can never be experimentally confirmed, and what can be checked is often so expensive to work on that only a very small number of possibilities can be examined. It's the maths (if we're talking beauty, I have to confess I find 'math' a very ugly word) that is in the driving seat, which surely is wrong. As Hossenfelder points out, string theory works best if the cosmological constant value that reflects the expansion or contraction of the universe is negative. Unfortunately it's actually positive, but most string theorists spend their time working with a negative cosmological constant. It can make for beautiful mathematics - but has nothing to do with our universe. It's also the case that the vast majority of theoretical advances in physics were made by individuals, where now most theoreticians work in teams - it's tempting to wonder, if a camel is a horse designed by committee, what is a theory developed by group consensus? Hossenfelder repeatedly comes back to two measures used to test theories - beauty, which is inevitably a subjective phenomenon, even though there is some agreement of what is required for beauty - and naturalness, which appears more scientific as it involves numbers, but relies on a bizarre confidence that values in nature that are dimensionless (for example ratios of masses) should be Goldilocks-like in not being too big or two small, but should be around the value of 1. The physicists she speaks to through the book (nearly all male), often seem to cling onto these measures without being able to justify them, other than saying that everyone else likes them too. There are some attempts - one suggests the appeal to beauty is an evolutionary response to a successful theory, but that only shows a weak understanding of evolution (though evolutionary developments can, at least, probably explain the physicists' love of symmetry - and it's not because nature has to be that way, but because we find symmetrical faces attractive). Vast amounts of physicist-hours are being put into theories such as string theory, which seems pretty much incapable of doing the main job it is supposed to (though does have some side benefits), or defending the extension of the standard model of particle physics called supersymmetry, even as more and more evidence suggests it is unlikely to be true. Hossenfelder shows that clinging to theories past their sell-by date is almost inevitable because physicists are people too. If you've spent half your career on a theory, you don't give it up easily, even though scientists are supposed to love falsification. And if hundreds of other people (remember the geese) are working on a particular theory, surely it must have some substance behind it? One thing the book doesn't mention, but may be worth thinking about, is perhaps there are too many theoretical physicists? Hossenfelder points out in a period of about a year when the LHC produced data that looked interesting but turned out to be a statistical fluctuation, 500 papers were published exploring this non-event theoretically, many published in top journals. Relatively briefly, Hossenfelder also examines the aspects of modern academic scientific life that make it hard to give the amount of time to actually working on theory that should be the case, citing estimates of around 40% going to actual work (another 40% going to grant applications). The processes required to get funding also tend to work against original thinking and deviating from the goose flock - there seems little doubt that this structure makes a large negative contribution to the whole business, though no one seems to have an answer to the problem. The only negative I have with the book is that Hossenfelder, like many practising physicists, struggles to explain some of the actual physics in a way that conveys any meaning to the general reader. Luckily, this is not essential here - this is not a book to learn about physics, but about the way modern physicists work. Interestingly, Hossenfelder complains that 'popular science books about special relativity are often full of rocket ships and satellites passing each other. But all of this is unnecessary decoration. Special relativity follows from the three symmetries [she lists] above, without twins in spaceships and laser clocks and all that.' While this is true, the way symmetries are used here is an argument that is near-impossible to follow for a non-mathematician. The twins paradox and light clocks make it much easier for the rest of us to get a grip on the subject (and, to be fair, my undergraduate special relativity textbook makes use of both, so it's not just popular science doing it). Inevitably there will be a widespread negative reaction from the physics community (which has already started) - but this is not surprising when Hossenfelder is attempting to burst a self-reinforcing social bubble just as powerful as those that surround American political parties. The knee-jerk reaction is always to deny there's anything wrong - yet here it seems so obviously a case of the emperor's new clothes. Some readers may take this book to be an anti-science one - but it really isn't. Hossenfelder is merely pointing out a deep problem in some parts of physics, but she in no way undermines the remarkable scientific discoveries that have come from centuries of physics (and applications we benefit from as a result of some of them). Rather, she is saying that people in her profession need to step back from the coalface and take stock of what they are really doing and whether this particular approach really makes sense. True creativity often requires this - but most of us find it difficult to do. And it's about time a physicist said this. Highly recommended (and very brave).